Gospel and Law in Reformed theology form two distinct but inseparable aspects of the one revelation of God. 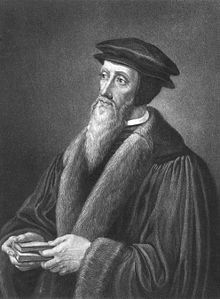 The Reformed way of relating gospel and law is often used to distinguish Reformed theology from Lutheran theology. 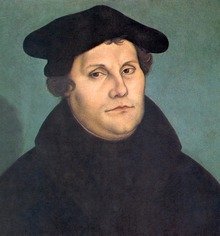 For Martin Luther (1483-1546), even though gospel and law are both considered part of the one Word of God, the chief task of the theologian is to refine one’s ability to distinguish law from gospel, letter from spirit, works from faith. While the Reformed recognize the importance of these distinctions, especially in covenant theology with its unfolding of the historical economy of the covenant of works and the covenant of grace, the Reformed were more concerned to comprehend the law as a positive form of God’s grace. The sentiment from Psalm 19 – that the law of the Lord is perfect, converting the soul, making the simple wise – is a foundational conviction of Reformed piety. The rigour of the law, including its ceremonial prescriptions under the Old Testament dispensation, has been removed as a result of the gospel of Christ. But the gospel indicative, the liberation Christ has achieved for sinful humanity, creates an ethical imperative that includes obedience to God’s commandments. 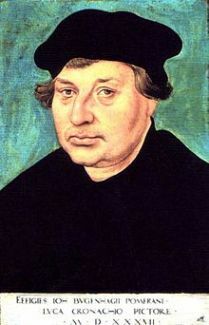 When Martin Luther (1483–1546) preached from the Gospel passages on John the Baptist, he always emphasized how John’s finger pointed to Christ, and how the church must follow in John’s footsteps and point people to the Lord without fail (refer to the picture below where Luther is doing the same). Here you see one of the major issues of the Reformation. The Roman Catholic Church clouded the gospel by adding assistants and helpers into the mix of salvation. Rome preached a gospel of “Jesus and:” Jesus and Mary, Jesus and purgatory, Jesus and the saints, Jesus and works of charity. 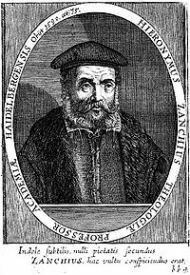 Luther and the Reformers cleared the fog by ridding the church of helpers in salvation. They preached the gospel once again in all its clarity: Christ and Christ alone is sufficient for salvation. Since Rome has not changed, and since our own hearts constantly look elsewhere for salvation, the issue is still before us today. So it is still the duty of the church to clear away all helpers and assistants in salvation and preach Christ and him alone. He is all we have for salvation, but he is also all that we’ll ever need.